Did adobe just kill Flash themselves? 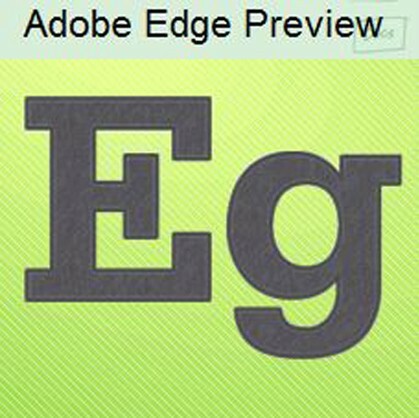 Adobe released the first preview of their new HTML5 media authoring tool called Edge. To give this a ultra-fast test-drive we wanted to see what we could produce in just 5 mins using the software for the very first time and what that output actually looks like. The results are actually quite impressive. For our test we elected to try something very simple and see how it looks. A single background image, in motion, with a rounded corner rectangle floating across it, changing colours, and then fading text. Basically standard elements of an animation. More interesting are some of the discoveries about the output. The resulting output consists of an html file, css file, custom JS, images folder, and some standard includes. This has some great potential although it will still have the code bulk of any WYSIWYG system the resulting output seems very clean from a foundation point of view and that bodes well for where this could go. Certainly a tool to watch for anyone building media for the web who doesn´t want to get into anything to do with Flash anymore and prefers to work in a tool rather then mess with code and CSS manually.